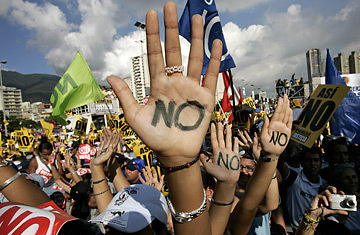 People take part in a closing campaign rally against Venezuelan President Hugo Chavez's proposal of constitutional changes in Caracas, November 29, 2007. Haiman El Troudi has a job that most post-Cold War Marxists can only dream about. As the director of the Miranda Center in Caracas, a policy research think tank set up two years ago by the government of left-wing Venezuelan President Hugo Chávez, El Troudi formulates socialist strategies that actually get put into practice. Some of them, like an epic campaign to create "socially oriented" industrial cooperative factories, will be put to a national referendum this Sunday, when Venezuelans vote on a raft of constitutional reforms that Chavez says will create a model of "21st-century socialism." From his offices inside a tower in the capital's Parque Central complex, once one of the country's capitalist nerve centers, El Troudi boasts, "Our revolutionary process is at a point of no return." Not if Venezuela's street protesters have anything to do with it. This week thousands of students braved police tear gas to demonstrate against the socialist proposals. "This is a country divided in two" over Chávez, says Stalin González, a student at the Central University of Venezuela in Caracas. "We're against the reforms because they don't [promote] reconciliation" between the country's left and right. Responding to Chávez's claims that the students are simply tools of the "oligarchy," Ricardo Sánchez, 24, another Central student, insists the movement also includes "the working class, peasants, housewives. We're not rich Mommy and Daddy's kids." Even some of Chávez's allies want to put the brakes on the President's radical train. Many reform proposals, they argue, are less about empowering the people than about concentrating power in the hands of Chávez. Among the initiatives: eliminating presidential term limits; putting the now autonomous Central Bank under the President's control; and the creation of regional vice presidents. Provincial leaders like Ramón Martínez, Governor of eastern Sucre state and himself a socialist, consider the latter idea a lavish centralization of federal authority, as well as a betrayal of Chávez's Bolivarian Revolution (named for South America's 19th-century independence hero, Simon Bolivar). "This revolution was supposed to create more pluralism in Venezuela," says Martinez. "We don't want a megastate like the Soviet Union." Still, despite polls that show tepid support at best for the reforms  as well as the growing anti-reform protest movement by university students, a cohort that used to be a reliable vanguard of Latin American leftism  Chávez is expected to win on Sunday. That's largely because the fiery anti-U.S. leader knows how to get out his base. His administration has politically and economically enfranchized the majority poor for perhaps the first time in Venezuela's history and he has been very skillful at whipping up that mass of his support by portraying contests like this as martial resistance to the threat of yanqui imperialism. "This is a battle, a political war, an international conflict!" he shouted on the referendum campaign stump in Caracas this month. "The U.S. wants a Venezuela on its knees, but the Bolivarian Revolution will struggle until death!"